Having been awarded the European Golf Resort of the Year title many times in its illustrious history, La Manga sets the standard for golf destinations across Europe. While La Manga is a truly all-encompassing resort, offering a host of great activities, the quality of the golf is the main attraction for many visitors. The three courses on offer at Real Golf La Manga Club; The North, South and West courses, are all outstanding. The courses weave across the undulating terrain of the 1400-acre resort, boasting beautiful views over the surrounding landscapes. Found on Spain’s stunning southeastern coast, just 35 minutes from Murcia International Airport, La Manga is incredibly accessible for golfers coming from the UK. The luxury accommodation at the 5-star Principe Felipe Hotel is first-class from start to finish, with all of the well-appointed rooms boasting a balcony with views of the pool or golf course. La Manga has an incredible 15 bars and restaurants, guaranteeing something for everyone’s taste. There is also an award-winning Wellness Centre on site, aimed at ensuring your mind, body and soul go home as relaxed as you’ve ever been. The South Course is widely regarded as Real Golf La Manga Club's premier layout, and frequently hosts prestigious regional and national events, including the Spanish Open and European Tour Qualifying School. Originally designed by Robert Putman prior to opening in 1971, the South was reworked by the great Arnold Palmer in the early 1990s, and was sharpened up in 2004. As a result, this is now a fair but thoroughly exacting test of golf. At just over 7100 yards, the course certainly provides the sternest test of golf from the three courses, and lives up to its championship status. Whilst requiring some solid hitting, golfers should beware of the countless water hazards and bunkering throughout the course. The front nine is the tougher, and contains two particularly challenging par 3s, both over 220 yards, as well as a 6th hole containing a blind tee shot onto a expansive and downhill fairway. However, there are still birdie chances on these long holes. The back nine, although less difficult, has many dog-legged holes and is home to one of the largest sand traps in Spain, running almost the whole length on the right hand side fairway on the par four 14th. Avoiding strategically positioned water hazards and bunkers is crucial around this par-73 cracker. The closing hole is unforgiving. Drives must be hit around a fairway bunker and two large bunkers which flank both sides of the fairway. The green, although large is very well protected and its multi-tiered nature requires a confident putt. Real Golf La Manga Club's North Course presents a different test, with tighter fairways and larger greens, all bordered by the resort's famous palm trees. While this course may be for the higher handicapper, it makes up for its lack of challenge, which can be found in La Manga’s other two courses, by priding itself on its beauty, boasting some very attractive holes. It is much hillier than the south and many of the fairways are lined with palm trees, while imaginative greenside bunkering is sustained throughout. The back nine certainly presents a better set of holes than the front, with the par four 13th leaving you with a tee shot that requires a confident club choice and a 18th hole which is satisfying to say the least. The putting surfaces have recently been reconstructed in accordance with USGA design principles, and many have severe slopes and plateaus, that are tricky to say the least. Accuracy and sound course management are the most valuable traits around the 6,291 yard North, which is a gem that will be particularly enjoyed by the creative shot-makers out there. The 18th is a lovely finishing hole, with the hotel pool in the background reminding you that your post round refreshments are not far away. In fact, only a short walk back to the clubhouse bar. The West course is unquestionably the pride of Real Golf La Manga Club, with an amazing variety of holes. A beautiful course with spectacular scenery everywhere you turn, it provides a demanding test of golf requiring a first-rate game management. Frequent changes in elevation and fast greens, can cause bad shots to be punished severely. The West Course is also a genuine championship layout, underlining the fact that Real Golf La Manga Club has no weak links. Measuring in at 6,529 yards, the West winds its way gently through the idyllic pine trees, and has more severe slopes than its neighbours. The West is in fact the favourite of many repeat visitors, particularly because of its unique setting and outstanding views. The fairways are tight, so it is often prudent to play conservatively from the tee, while the West also boasts a collection of fabulous par-3s. The pearl of the front nine is the 9th which has an uphill tee shot, before the hole bends backwards at right angles into a ravine to the front and a lake at the back. The back nine boasts a lovely streak of four closing consecutive holes, including a par three 16th with little margin for error, before ending with a magnificent 18th. Did you know? The former Formula 1 World Champion, Nigel Mansell, labelled the 18th on the West Course as ‘a great finale’ stating that ‘the magnificent view from the tee is always something to look forward to’. Although the 18th tee is a bit of a walk up a hill, it gives plenty of anticipation for what is a fantastic closing hole. Once at the top you are greeted with a tee shot at the top of a small mountain overlooking a wide fairway-a 200 yard carry and the wind looking to play its part. An intimidating shot. However, what makes this hole truly special is the view for miles distant, the landscape spreading beyond the Real Golf La Manga Club complex, over the countryside and into the sea. A final picturesque image for a remarkable course. The practice facilities at Real Golf La Manga Club are second to none. The Golf Practice Centre is seen to be one of the finest in Europe, while the Leadbetter Golf Academy is known for its innovative and creative teaching techniques. The new academy was founded by David Leadbetter himself, a coach to countless PGA Tour, European Tour, LGPA Tour and Champions Tour players. It has two swing rooms and four teaching studios for groups. On top of this, La Manga possesses a beautiful par 47 “pitch and putt” course ideal for perfecting your short game. The course is well designed with bunkers, water hazards and excellent greens for putting. Real Golf La Manga Club contains two Clubhouse restaurants. Bar 57, which can be found at the main golf clubhouse, offers golfer’s breakfast, lunch and dinner, with free Wi-Fi and a terrace overlooking the golf courses. It’s open all year from 7:00 to 19:30. By the West Course, is La Princesa Restaurant. It serves typical Spanish cuisine with a great choice of wine and lovely views of the course and surrounding pine woodland. Also open all year round, for breakfast and lunch. The courses at Real Golf La Manga Club are always cared for, allowing the holes to be in optimum condition. The resort also benefits from an efficient shuttle bus service. It is no wonder that La Manga has won many awards, such as Europe’s and Spain’s Best Golf Resort in the Today’s Golfer Travel Awards in 2012, 2013, and 2014. However, while the golf at Real golf La Manga Club is certainly the heart and soul of the club, Real Golf La Manga Club also offers plenty of other sport facilities. This includes tennis courts as well as football, cricket and rugby pitches. A junior club is also available- an ideal place for your children to have fun in a friendly, secure environment while you enjoy the great variety of courses La Manga has to offer. Real Golf La Manga Club's accommodation is also first class. 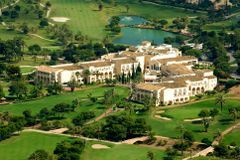 The luxurious Hotel Principe Felipe offers breathtaking views of Real Golf La Manga Club's courses, pools and gardens. There are also plenty of apartments nearby in Las Lomas village if you prefer greater space and independence. The resort has a comprehensive golf academy, and also runs regular competitions that guests can enter. NB - Please check golf club dress code before travel. Very enjoyable stay, good sized comfortable room overlooking the 18th. Breakfast not quite as good as I remember it but still good. Hotel restaurant and bar a bit bland, lacks a bit of atmosphere but still ok. Definitely worth a visit, we’ll be there again next year. Excellent service. Carlos the concierge was exceptional and helped us to enjoy our break to the full. We will definitely visit again. A great venue, only criticism was bar prices were excessive. Great place to stay for the quality of staff and location central to golf courses. We hope to come again. The facilities were excellent as were the staff. The self service Breakfast was rather chaotic and in my opinion could be improved.This was the only fault on an otherwise excellent hotel. Good hotel but probably not 5 star, odour of drains in rooms an corridors. The room was ok but it had a damp problem and you could smell this in room and carpet in corridor was stained and constantly wet. Also was supposed to get 15 euro room credit but hotel refused to honour this deal which was annoying when settling water bill (3 euros for small bottle) at end of stay. Accommodation was all we expected it to be having stayed there several times before. Very helpful and made holiday very easy and enjoyable. Excellent golf break, good courses suitable for good players and less talented too! Very good facilities- food, accommodation and leisure. My caddy tip: "It is longer than it looks take longer clubs"
My caddy tip: "Again this course plays long be carful in club selection"
Was five star and more we are returning again this year. My caddy tip: "Spend plenty of time on practise greens as they are very quick ." My caddy tip: "All par 3's very testing." Great company and very efficient. Keep doing what your doing. My caddy tip: "Play safe and lay up generally." My caddy tip: "Don't go for the big shots. Always lay up.."
My caddy tip: "Lay up and always nurse your way round the course.."
My caddy tip: "Before your round go and buy yourself few postcards from La Manga area and then focus simply on your game." My caddy tip: "18 TH - enjoy the vista from the tee (view simply to die for)." We keep on returning because of the two fine courses and the very accommodating staff. My caddy tip: "11th stay on the fairways. Play within yourself." My caddy tip: "Play within yourself." Everything was as booked, collection at the airport was on time, hotel superb with excellent service, golf tee times were all as reserved - restaurants around the resort really nice with a free shuttle service. My caddy tip: "Play this course first to get your game going as it's the easiest of the three. Choose the right club - receptive greens." My caddy tip: "Be aware of the water hazards." My caddy tip: "Quite difficult course easier second time around - not for the high handicap golfer - tight fairways, tree lined, lots of hidden hazards. Don't be adventurous and keep the ball in play." Just a fantastic place and resort. easy to get about, we stayed in the hotel and you can walk to 2 courses with the caddy master looking after your clubs over night. The buffet breakfast was 5 star and a great choice of restaurants within 5 minute walk. My caddy tip: "Make sure you know the yardage to any hazard ." My caddy tip: "Take time round the greens." My caddy tip: "Really need to keep the ball in play, do so and you will really enjoy it. just because it's a Par 5 you don't have to hit a long iron or wood for your second shot. Learn about out of bounds posts and buy yourself a Bushnell Lazor to get correct distance." I would use YGT again and would like to thank them for the organisation and assistance given. Everything was of a good standard. Staff were very friendly and the local restaurants were of excellent quality. My caddy tip: "Think your way around the course and around the greens be positive with your chipping. outside the fringe clings to the club.It is a good holiday course. We played off the yellow tees and a lot of the holes you can play off with a 3 wood. The time we played the course was very busy so have patience.."
My caddy tip: "Again a good holiday course. My favourite holes were the par threes. Some difficult holes and would suggest anybody of my standard plays up to the hazards and not try to get over them with their first or second shots. The greens are difficult to read. Again have patience as the courses were very busy." My caddy tip: "Very tight, leave the driver on the bag for most of the front nine"
My caddy tip: "Stay straight"
My caddy tip: "only use irons no driver"
My caddy tip: "Take a bigger club than you would at home "
My caddy tip: "Bring plenty of balls." Our spiritual home. Been there over 20 times. Love La Manga and great golf. My caddy tip: "Dont go for every shot. Lay up and play safe." My caddy tip: "Best course in La amanga. Play safe." My caddy tip: "Lay up everywhere." What a test of golf for all. You'll need to add more clubs for the up hill shots as the green eat the ball when they land. Par 3's what a variety of lengths. The 18th what a great hole to finish on. My caddy tip: "Add one club for the up hill shots and take full swings as the greens are unbelievably receptive." My caddy tip: "Very long, the 4th, 11th, 14th, 16th, 18th fantastic holes. Add a club to your calculations. " My caddy tip: "Be prepared for a a test of golf that you haven't come across ever before. It's narrow, it's demanding, the green a re significantly smaller than the two other courses. Take a camera for the 18th and if you get your drive past the bunker on the left hand side your a big boy!" We visited La Manga for a second year running, having had a superb long weekend playing golf in August 2013. The hotel occupies a prime position within the resort and the convenience of only a short walk to the golf courses is a big advantage. For those wanting to venture further afield, there are plenty of other options within an hour’s drive. The hotel has done an excellent job in retaining a clean and relatively high-end ambiance, both in terms of the restaurant / bar areas, in addition to the spacious bedrooms. The quality of the courses is a major attraction for our group of golf enthusiasts and there is a good balance of challenging and forgiving holes across all of the courses. Certainly the North course is a little more forgiving however that didn’t detract from its excellent condition. The ongoing re-design works on the 17th hole of the North course was the only negative feature and the shortened driving range did not allow for practising the longer clubs in the bag. However that is a very minor criticism and shouldn’t detract from the quality of the courses, the staff and the hotel. I’m sure we will visit again. Despite my worst score this is the easier course as it is shorter with a little less water but plenty of ‘ barancas’. Quietest I have ever seen it when we played- 9.30 on a Friday morning- got round in record time. You often play back nine 1st here for some reason. It is longer and therefore more of a challenge to handicap golfers with more water in play. Generous fairways give u a chance to keep it in play. Driver not required on most holes - plot your way round. Generally Narrower and more interesting than the south with more water and ravines to cross. Enjoyable...condition same as the other courses. Mainly Long straight-ish fairways with some interesting ravines. Enjoyed the course - greens were a bit ‘spongy’ and needed some repairs but overall good. A bit slow with a slow 4 in front taking their time and not really caring about the Q behind. Good time to go, nice weather, not toooo busy. enjoyed it although the greens seem to have been over worked. Again greens very poor and let down the experience of playing on this magnificent course. Superb course in excellent condition. Lovely course - greens were in terrible condition, threadbare, lots of unrepaired pitch marks. I assume just end of season tiredness - but let down the playing experience. More difficult terrain but still very enjoyable. Followed 3 ladies who I believe found the course very difficult, we were held on 12 tee's and not ever called through, needed a course marshal. Why are the buggy rental costs so expensive. Hope the greens get a rest, they need to recover from heavy use. It is evident that players spend a relatively long time on the greens. Enjoyed, lost just one ball. Buggy hire cost too expensive though. The most difficult course of the three with very challenging left and right doglegs. Fairways needed to be landed on otherwise the result was usually a lost ball in the surrounding countryside. Enjoyed this course the most and if I get the opportunity to return I would play it twice. Some of the 'next tee' sign positions need improving for golfers on their first visit. Different from the south course with approach shots requiring more thought but the fairways were just as good. Enjoyed the round. Enjoyed the round, especially the quality of the fairways compared to most I play at home. This course was hard particularly playing it for the first time and not knowing the many peculiarities that make it special. This is certainly not for the faint hearted,the view from the 18th tee is spectacular and goes some way to ease the challenging drive ahead of you. Best course of the three for me although probably easier than the West. As on the South course there was a lot of pitch mark damage on the greens. Good course and interesting holes, not as difficult as the West Course. Rather irritating caddy master saddling our three ball with an additional player (although Juan was very friendly if slightly slow) then persistently telling us to speed up! Very interesting and challenging course. Generally in very good condition. One of our party described it as 18 tees and 18 greens and messy in between! 4 of our group decided to play the west course the only slot they could get was 8am so off they went and when they arrived found that the buggy shack was the only thing open. no refreshments at all as the catering/drinks was closed. when they were out playing eventually at 11-30 the drinks cart arrived.they thought the 400 odd euros was quite expensive to pay but to have no refreshments to 11-30 was disgraceful.however we all enjoyed playing the course the day before and had a very good meal after we finished playing. Q – Where's best to eat? A – The very best thing about La Manga, is that whatever time of year you visit you will always get a good choice of places to eat and drink. My tip; head for the hotel managed restaurants, from which I’d recommend Luigi's Italian up at Las Lomas, and in particular the seafood restaurant La Cala which is located at the beach. Alternatively the steaks at Meat Point, located at The Tennis Club, are excellent. Q – What else is there to do at La Manga? A – Sport is the name of the game at La Manga, a game of tennis at the tennis centre, a trip to the incredibly well equipped gym or my favourite, a day on a bike. There are great mountain bike trails within the resort, or hire a road bike and head out to the Portman Hills, complete with the Green Mile climb, after which you will have well and truly earned your beer! Contact Geoff at biking La Manga in the plaza...and tell him Darren sent you! Q – Where's best to visit during time away from the golf course? A – Cartagena is only 15 minutes away, and offers a fascinating day out. Founded by the Romans, Cartagena was once Spain's Capital and to this day is one of its premier naval basis. The old town is awash with great little bars and restaurants, and dare we say it perfect for an afternoon bar crawl once you've seen the sights. Q – Where do I go for nightlife outside of the resort? A – Head to either the La Manga strip (June-early September only) or Los Alcazares. Both places will keep you entertained until the early (or indeed the late) hours of the morning, with both being busier at weekends than during the week.